EngNet » Product & Service News » A range of Heavy Duty RCCB units from FDB for when you really have to get serious! A range of Heavy Duty RCCB units from FDB for when you really have to get serious! The FDB Electrical series of FDB 19 heavy duty RCCB units is designed to overcome inherent earth leakage or inrush currents, combining a variable sensitivity and time delay RCD together with a triple pole MCCB (minimum 16 KA) to provide overcurrent and short circuit protection. With a unit of this type there is no “typical” application since it is suitable for use throughout industry from construction sites, mines and quarries to mobile plant and cranes and for the protection of stage lighting systems where thyristor spikes can trip conventional RCD’s. A standard feature of the unit is its non-fail safe operation ideal for primary breaker installations or those that are unmanned or prone to supply interruption. The standard FDB 19 series combines a variable sensitivity and time delay RCD, together with a triple pole MCCB (minimum 16KA) to provide overcurrent and short circuit protection housed in an IP65 zinc coated steel enclosure. For example, a special STS variant of the FDB 19 series is used as a special-purpose power supply unit by the Royal Marines for landing craft such as the RM rapid-response/patrol boat. Typically RM landing craft were used to patrol the harbour approaches at Weymouth and Portland during the 2012 Olympic sailing events. The FDB19/STS is a specially configured version of the standard FDB 19 Heavy Duty Adjustable RCCB designed to be mounted on offshore pontoons that are supplied from shore based transformers. Once moored, landing craft can plug into the FDB19 and recharge on-board batteries and ancillary equipment. Housed in GRP enclosures with glazed panel to provide sight of the various LED status indicators, the equipment comprises a 60A, 16KA MCCB feeding an electro/mechanically interlocked socket outlet. 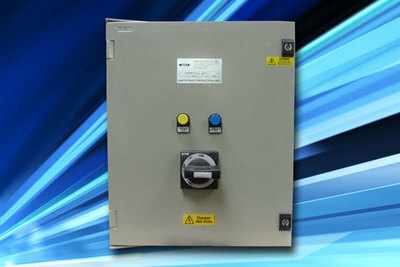 Electrical protection is provided by means of an EFU15 multi-function RCD and Emguard Earth Continuity Monitor; both manufactured in-house by FDB’s relay division. External Test and Reset buttons facilitate ease of operation and testing. Further information on the FDB 19 heavy duty RCCB can be found at www.fdb.uk.com/project/fdb-19/. See their online shopping website at www.fdbonline.co.uk and find the latest information and news on the FDB blog – www.fdbnews.co.uk.